In an earlier Natural Society article I covered aluminum toxicity antidotes that are necessary in our toxic environment. It’s often argued that aluminum is ubiquitous within the earth’s composition, but it has been pointed out by UK scientist Chris Exley, Ph.D that there is little threat as long as aluminum remains there. But it is obvious that aluminum exposure has become an issue; luckily there are some solutions for handling this kind of exposure. 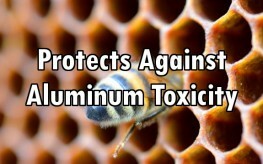 Now there’s no shortage of aluminum toxicity in our environment. It’s in cookware, beverage containers, foil, second hand cigarette smoke, cosmetics, sunscreen, chemtrails used for geoengineering, and in nearly all vaccines. Injecting aluminum bypasses the normal potential route of eliminating it, and breathing in those chemtrail aluminum nanoparticles that drift to sea level does as well. Aluminum accumulates in tissue that doesn’t have a rapid cellular turnover. The slow turnover tissues are contained in bone matter, the heart, and the brain. The brain and its associated nervous system is where diseases such as Autism, Parkinson’s, MS, Alzheimer’s, dementia, chronic fatigue, and other neurological or auto-immune diseases manifest. 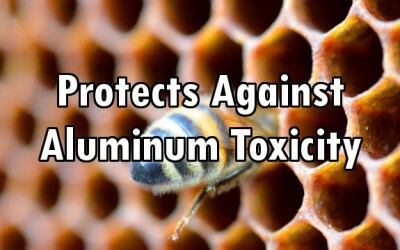 And aluminum is often involved with all the above. Here’s that earlier Natural Society article. What Exley recommended for neurological disorders from aluminum toxicity is Volvic water (unflavored), a rather pricey European mineral water that a few health food stores carry and can also be ordered online. That’s his choice because of its suspension of silica in liquid, which enables the silica to cross the blood-brain barrier and bind with the aluminum to pull it out of the brain. But silica from other sources, such as horsetail herb extracts or cucumbers will be helpful for pulling aluminum out of other organs such as the heart and bones. Not long ago in India, a group of researchers discovered another substance for chelating aluminum. Propolis is one of honey bees’ healthy products, including royal jelley, bee pollen, and honey. Each of those has its own unique collection of health benefits.There have been many studies on propolis for its antimicrobial, anti-fungal, and anti-tumor properties. The bees use propolis as a sealant for their hives. Researchers at Jiwaji University in India recorded the results of studying propolis for chelating aluminum on rats in the July 2012 journal Food and Chemical Toxicity. The researchers made comparisons using propolis alone to HEDTA or N-(2-hydroxy ethyl ethylene diamine triacetic acid) (a known chelating compound) and then combining the two for reducing aluminum (Al) induced toxicity in liver, kidney and brain of rats. They discovered that either HEDTA or propolis reduced Al toxicity very close to the level of rats without induced Al toxicity (control), but the combination of the two was best. There’s little data on it for human consumption. Propolis is accessible online and from most good health food stores. And it offers many other benefits as well a being a source of natural nutrition. i can’t resist–you need a reality check; it’s self-evident. [Literally] all you have to do is open your eyes and look at the stuff around you. And when you add in that they’re spraying aluminum in the sky, well..